This may hold true for your pet as well as yourself. It tugs at the heartstrings every time you are separated from your pet. While we’re sure your four-legged friend would be in good hands with someone else, you will be much more grateful to be with your pet in one of our pet friendly cabins in Gatlinburg. That means no sitter and a family gathering that doesn’t leave anyone out of the fun. While having the ability to bring your pet with you on vacation is a special amenity in itself, our pet friendly cabins in Gatlinburg are suited to meet your every need. We have small, compact cabins for 2 people, and we also offer larger cabins that sleep up to 14 guests. When we say that we have tons of additional amenities in our cabins, this includes things like game tables, Jacuzzi tubs, a full kitchen, WiFi and DVD players. You’ll be excited to learn that you don’t have to keep your dog at one of our pet friendly cabins in Gatlinburg when you venture out for some sightseeing! Some of our cabins are close enough to bring your pet along for a nice stroll into town, or maybe you’d like to bring a favorite toy for him to fetch. Mynatt Park in Gatlinburg is a perfect place in town to bring Duke or Daisy for a walk, and there are a few other parks located nearby that have walking trails. Speaking of trails, the Gatlinburg Trail is one of the most popular trails to take your pet for a hike, since it’s one of the two in the Great Smoky Mountains National Park that allows dogs. There is little to no incline, and the best part is that it follows the beautiful Little Pigeon River, so your playful pup can enjoy walking past the rushing stream. No one wants to break the bank if they don’t have to when booking a cabin for vacation. 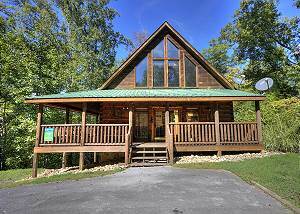 Our pet friendly cabin rentals in Gatlinburg are extremely budget friendly without sacrificing cleanliness and quality. That’s why our cabins are a hit with guests. We offer all the comforts and conveniences of home in close proximity to all the action in Gatlinburg so your hard-earned money can be spent in the Arts and Crafts Community, or many other small shops that offer fantastic service downtown. Our pet friendly cabins in Gatlinburg are perfect for you and your furry companion. Browse our pet friendly cabins in Gatlinburg and book your stay today with Acorn Cabin Rentals so you can share your vacation bliss with your non-human family member!